Every spring and summer huge masses of Arctic ice are detaching and falling into the sea, as shown on countless news reports worldwide. The melting, scientists tell us, is a result of human-made global warming. It has gotten to the point where presently, a passage through the Arctic Ocean that was frozen solid for ages is being eyed as a new shipping route between North America, Europe and Russia. Similarly, ice sheets are disintegrating in Antarctica and Greenland, and glaciers are melting in the Himalayas and Bolivia. But this is not only happening in remote locations. For the Japanese, it is also touching a place closer to home — the Sea of Okhotsk off the coast of Hokkaido, the northernmost of Japan’s main islands. The Okhotsk has long been the southernmost spot in the Northern Hemisphere where polar sea ice is found. After spreading southward out of the Arctic each winter and along the eastern edge of Sakhalin Island, the ice typically arrives in Hokkaido in mid to late January. The best time to see it is the latter half of February but it stays until late March or early April. This drift ice has been an important tourist draw to towns like Abashiri on Hokkaido’s northern coast, with local festivals honouring it and museums dedicated to it. What’s more the drift ice helps to sustain the area’s marine life. “Drift ice is a natural thing, not something man can control. That’s why we want people to see and experience it,” she said. But how is the ice diminishing? The simple answer is that the amount of ice is thinning and it arrives later each year because of global warming. The meteorological observatory blamed strong western and south-westerly winds for the delayed arrival this year, while others point to a warmer winter. It is no coincidence that this was around the time of the “first big pulse” of media coverage and public attention about global warming, according to Andrew Refkin at the New York Times. Just the year before in the US, NASA climate expert James Hansen told a Senate panel that global warming was happening and it was already changing the climate. The thinning of the drift ice is a clear indicator of climate change right on the doorstep of Japan. This year, it arrived at the Abashiri shore 18 days later than the average year, the second latest date since 1959. It is one of many tell-tale signs across Japan. For instance, cherry trees blossom earlier each year. In Tokyo this year they blossomed seven days earlier than average for the past 30 years. Some experts say the cause is climate change and the heat island effect. 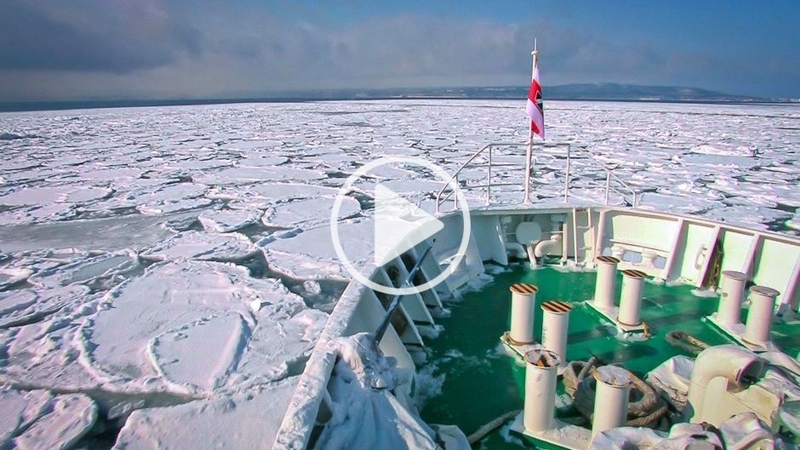 The changing pattern of drift ice is caused by a combination of factors, as shown via animation in the videobrief. These include the interaction between frigid temperatures in Siberia, freshwater from the Amur River and the fact that Okhotsk Sea is sheltered from the Pacific by a series of islands. Scientists have noted that Siberia is getting warmer, that wind patterns are changing and that the temperature of the Okhotsk Sea is rising. The changes are gradual, but they are enough to affect the drift ice and to cause local concern. The temperature in Siberia has risen about 5 degrees over 30 years, he said. For more information on the process, watch the video interview with Prof. Mitsudera here. The drift ice is an important winter tourist destination. Many tourists now find themselves on the front line of climate change, without fully appreciating what is going on. Drift ice tourists cancel their hotel bookings if the ice has not arrived. The same is happening with other natural sightseeing vacations. For many Japanese, the cherry blossom is a cultural icon and hanami — flower viewing — is a special time to get back to nature. When you realize that full bloom lasts only a few days, and that Japanese people and foreign tourists plan weeks in advance to go cherry blossom viewing, people are relying on accurate predictions from the Japan Meteorological Agency. It does make planning of cherry blossom vacations more difficult. The drift ice also plays a role in the Okhotsk Sea’s ecosystem as an important ground for fish reproduction so it’s loss has myriad consequences. So the economy of the area is very much dependent on the drift ice. Already the icebreaker boats and other ice-related activities see fewer customers and hotels get cancellations. In response they are turning greener. Green tourism is not a new idea. Many of us tend to understand it as not changing the towels and bed sheets each day or using less soap and shampoo. However, in Abashiri, local hotels are going farther than that — working together to reduce their carbon emissions thus helping to protect the drift ice, or slow the speed of its decline. One of their main carbon-saving techniques is setting thermostats at 20C in the winter. These actions are encouraged by the Okhotsk Drift Ice Trust Movement, set up by an Abashiri-based sightseeing federation and local residents. According to Kuniko Kashiwagi of Abashiri Municipality, the effort has caught on quickly. Last year, in particular, the movement pushed to raise awareness in the run-up to the G8 summit held in Hokkaido with the slogan “Save the Drift Ice, Save the Earth.” Indeed, drift ice loss did gain a lot of media attention at the time, but in 2009 the problem seems to have been over-looked. However, in order to slow the rate of drift ice loss, what is really needed are global steps to ensure steep reductions in emissions, to get the atmospheric concentration of CO2 down to and stabilize it at around 350 ppm, as some recommend (it is currently approaching 390 ppm). Hence, we really need to see an ambitious deal at the December 2009 Copenhagen negotiations. Tourism Meltdown by Luis Patron is licensed under a Creative Commons Attribution-NonCommercial-ShareAlike 3.0 Unported License. We have sacrificed the global environment on the altar of expediency, and now in the lifetime of our species we are facing adverse global climatic change. Our carbon footprint is exponential, and correlate’s, to a rise in global ambient temperature’s that are keeping pace with our species developments and expansions worldwide. It is no coincidence that as the globalization of industrialized developments gathers pace fueled by unprecedented technological advances, global warming increases exponentially! It is the historical innovative usage of the finite resource (petroleum) coupled with rapid development and change in land usage that has brought this monumental problem to our door. There is a clear correlation between exponential fossil fuel usage, and global carbon emission levels, which are a major global warming driving force. Sadly, the very resource (petroleum) that fuels our global growth enhances the greenhouse effect, which exacerbates global warming. We are caught in a desperate loop, a user cycle. Practically every aspect of our lives involves using resource that pollute. We are addicted to pollutants, like the smoker who has been told to quit the habit or it will be terminal, we promise, then relapse through lack of willpower, and clear understanding. Ill conceived Geo-engineering scheme’s, are akin to closing the door; after the horse has bolted. And will do little to stem the tide of the global climate tsunami that is heading our way. Alternative energy promotion; plus the introduction, of fuel efficient eco-friendly hybrid automobiles; only scratch the surface of a deeper broader 150 year pollution trail, that Keelhauling our planets resource has left in it’s wake, like, rapid global development; global land usage change, exponential fossil fuel usage, and aggressive adverse C o2 emission levels. This is a big ship for turning, It took 150 years of unbridled resource usage, to over-heat our planets Eco system; we cannot change direction with a quick tug on the wheel. If we are to learn anything from “The sinking of the Titanic”, it is that, there is very little room for maneuvering errors, on a fast moving vessel that has a protracted stopping distance. It is marked, that as we begin to map the limits to the known universe. We have just begun to understand the limits of the planet; we rely on for the continued survival of all dependent species. Radical global Climatic change is not new, geological samples taken globally, show major heating and cooling event cycle’s over time, the difference now, is that we are witnessing Accelerating adverse global climatic events in the life cycle of our species, that are not in line with historical trends or climate model projection’s. If we ignore the warnings, then it is business as usual, there will be more Casualties, from ripple effect geopolitical turmoil, spawned by an increasingly unstable global eco system, which will continue to make corrective adaptive measures, as it strives to maintain global ambiance. We must not discount the planets ability for radical simpatico adaptation, or second guess our earth’s superior Eco system which has survived for eons in hostile space environments. The part we play may be minuscule in comparison, however misguided in the extreme. We have already impacted; and are just beginning to realize the extent of the damage. The signs are there if we care to take our collective heads out of the sand. And face up to our global ecological responsibilities. Burdened by the enormity of the task, we have fallen into a malaise, we wait for science to reconcile, yet know that this time it will take not only all our ingenuity, but a truly collective global effort. Radical c o 2 emission level reduction is the only game in town and must have a timescale that allows for Global adaptation, coupled with nuclear and inclusive renewable sustainable Solutions, that measure up to the extent of the problem. Our failure to coalesce, for the long term mitigation of radical adverse climatic change, will force the planet to make that decision for us, whatever action we take then, will ultimately benefit the planet. I somewhere have the doubts that climatic change is actually there. In 1971 the word was that the global cooling is going to take place…but now its the exact opposite. Also it seems Canada tourism is having a pretty high growth.